Shopping at City Centre Bahrain just became a lot easier and smoother. Drop off your shopping bags at the Hands Free collection desks and collect them later or have them delivered anywhere at your convenience. Drop off your shopping bags at the Hands Free collection desks. All your items will be securely sealed and stored in the mall by our staff, along with your contact information and delivery preferences. 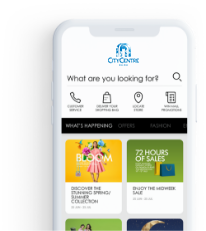 Have your bags brought to you anywhere, at your convenience, by using the City Centre Bahrain mobile app or calling our team 15 minutes before you ﬁnish shopping. You can also use the app to request a delivery. The service is completely free of charge for deliveries made inside the mall, to your car, or to hotels connected to the mall. We also offer home delivery priced at BD 3 for same day deliveries, and BD 1.8 for next day deliveries. For assistance or more information call +97377388827. • City Centre Bahrain reserves the right to decline the acceptance or collection of any bag that is not sealed or wherein the seal is open.